For precision, accuracy and comfort, laser dentistry can’t be matched. This relatively new technology allows dental professionals to focus on a specific area without any risk to the surrounding tissue. At Joe Isaacson Dental in Oklahoma City, OK, Dr. Joe Isaacson uses laser dentistry for a number of periodontal treatments. Dr. Isaacson has successfully used laser dentistry to treat a number of patients with gum disease. Carefully and gently, Dr. Isaacson removes diseased gum tissue, while at the same time disinfecting and cauterizing the area. Bleeding and damage to the surrounding tissue is minimized, so patients have a more comfortable experience. For patients requiring a cosmetic gum lift, or gingivectomy, because too much tissue shows when they smile, laser dentistry can be a much safer and less painful alternative to traditional surgical methods. 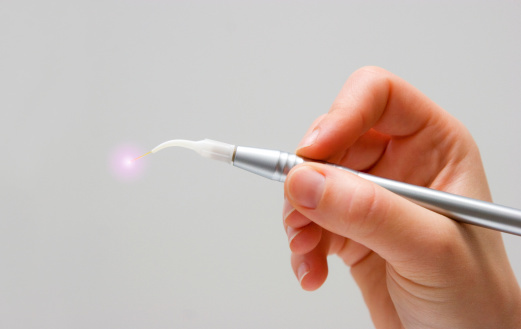 Using a soft tissue laser, Dr. Isaacson gently removes excess gum tissue to uncover more tooth structure. The laser treatment is quick, comfortable, and can often be completed in a single visit. Finally, if you’ve ever had a cold sore, then you know the pain and discomfort such a sore brings. With laser treatment, we can relieve the pain immediately and improve healing time. Because a laser sterilizes the sore and seals sensitive nerve endings, healing time is usually reduced to between 24 to 72 hours. If you would like to experience the comfort of laser dentistry, then schedule an appointment with Joe Isaacson Dental in Oklahoma City, OK, today. We also conveniently serve patients from Edmond, Yukon, Piedmont, and Mustang and the surrounding communities.